The outstanding SP-01 gets a tactical re-vamp. 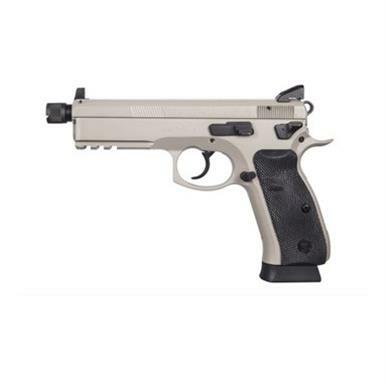 Blending the iconic single/double action of the CZ 75 with the improved grip ergonomics of the P-01, the SP-01 is a serious tactical sidearm trusted by military and law enforcement for duty use. The new grip geometry, checkering in key areas on the front and back straps, and redistribution of mass provided by the accessory rail noticeably decrease perceived recoil while allowing for more rapid target acquisition. As a testament to its robust performance and reliability, the SP-01 Tactical is in use with military personnel fighting the war on terror AND with competition shooters across the country. It's a gun that can do it all—and do it well. The SP-01 Tactical Urban Grey takes it to the next level with a threaded barrel, Urban Grey finish (a mix of grey and FDE), and high suppressor sights with tritium lamps. Go tactical. Nab your new handgun ONLINE today! Get your hands on one of the best-kept secrets in shooting. HK P30SK V3 Subcompact, Semi-Automatic, 9mm, 3.27" Barrel, 10+1 Rounds. Lightweight, subcompact handgun is a top concealment favorite!